The Wales coastal path network has been named the winner of a award from the Royal Town Planning Institute (RTPI). The coastal path was awarded the institute's Silver Jubilee Cup for planning excellence at a ceremony in London on Wednesday. 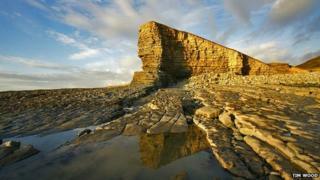 The network covers 870 miles (1,400km) of Welsh coastline, and was officially opened in May 2012. RTPI said the path project was "an inspiration" to planners. "The Wales Coast Path is a powerful message about identity," said the chair of judges for the competition, Sir Terry Farrell. "The UK's coastline is incredibly symbolic and the project demonstrates what can be done elsewhere." As well as the coveted Silver Jubilee Cup, the Wales Coast Path also won the award for exemplary rural planning. The awards were collected by the Welsh government's environmental body, Natural Resources Wales.